Though no further Journals by Robert Hosking have been traced, it is known that he remained in post until 1859. He was not only the most eminent Governor of Pentonville, but also the longest serving. We can from other sources trace some of the changes he oversaw during his span in office. Accordingly, the period of confinement in Pentonville was first reduced from 18 to 12 months, and subsequently to 9 months. However in the 1850s there appeared a sharp increase in the number of cases of mental affection among the prisoners. It was therefore deemed necessary to increase the amount of exercise in the open air, and to introduce the plan of brisk walking, as pursued at Wakefield. The change produced a most marked and beneficial effect upon the general health of the inmates. From this period onwards the discipline (in effect the strict adherence to the silent and separate system) was relaxed whenever `injury to health was apprehended' and the prisoner put to work in association with other prisoners. For the year of 1854 a table (see over) of movements of prisoners and a break down into age groups is very revealing. The first point to note is that deportation has ceased and Pentonville allocated to a range of prisons. Secondly the minimum age of 18 has been relaxed and a few under that age have been admitted. A list is then produced of the total staff in 1856. It is interesting to see how few staff were in post to run the prison, and that titles used then persisted still late into the 20th century. There are some of us that believe that the current fixation of always wishing to re-title does little for the Service and that tradition and inherited pedigree is important in itself and to staff who are proud of the traditions of the Service. They joined the warders assembling, two were still absent. "They are safe to be here" said one to us privately, `for there is a heavy fine if a man is not true to his time.' The other 2 having arrived, they were led and escorted by one of the principal warders - marked by the gold lace band round his cap - to a small room. This was the principal warders sleeping accommodation (clearly the equivalent of night orderly officer) but also contained the key safe from which keys were issued to the warders. We walked with the warders down the several corridors, the officers on duty proceeded to carry the bread and cocoa round to the prisoners who were about to leave that morning. The halls rang now with the rattling of the trucks on which breakfast was being wheeled from cell to cell. You see those clothes and table and chair outside the cell door there, they belong to men who have attempted to break out of other prisons, so we leave them nothing but their bed and bare walls for the night. When a man is a notoriously desperate prison breaker, we do not allow him even as much as a tin can for his soup, if we did so; he would probably convert the wire round the rim into a pick-lock, to open his door. Yes, sir, convicts are mostly very ingenious at such things. The warder informed us there are 4 warders on duty every night, form 10 to 6 in the morning, and each of them has to keep two hours watch. They have to peg regularly on what is called the `tell tale'. If there is anything of note at night the principal warder is called. The routine of the prison at this date would appear to be that at 6 a.m. one side of a landing would be unlocked and each prisoner would clean his cell and the surrounding landing, he would then take in the tools for whatever trade he was assigned to, then the opposite side of the landing would do the same. At 6.30 a.m. the brass hand bell was clattered to indicate to the prisoners to commence work in their cells. The trade instructors would circulate around the wings to ensure that each prisoner had sufficient materials for their labour. At 7 a.m. every cell was double locked, and all the warders, except one on patrol, descended to a mess room on the ground floor for their breakfast. The prisoners appeared to have their breakfast served at 7.30 a.m. This consisted of `ten ounces of bread' and three quarters of a pint of cocoa. For dinner the ration was half a pint of good soup, four ounces of meat every day - beef and mutton alternatively, five ounces of bread, and one pound of potatoes. (For some reason those working in association received two pounds of potatoes.) For supper every prisoner received a pint of gruel, made with an ounce and a half of meal and sweetened with six drachmas of molasses, together with five more ounces of bread. The Medical Officer could approve additional rations for any prisoner on health grounds, such as butter, or eggs or chicken or fish. For those on the punishment diet it was sixteen ounces of bread a day and nothing else except water. The maximum period was 3 days, before he would revert to the ordinary diet. The food came up from the basement kitchen by `lifting machine' and was then trundled along the landings on trolleys. The trade instructors were also employed in assisting the discipline staff serve meals, and breakfast for over 400 prisoners could be completed in 10 minutes. Sometime between 7.30 a.m. and 8 a.m. the Governor would make his entrance into the main prison. A warder would hurry before him crying `Governor.r.r' as he opened each of the cell doors. 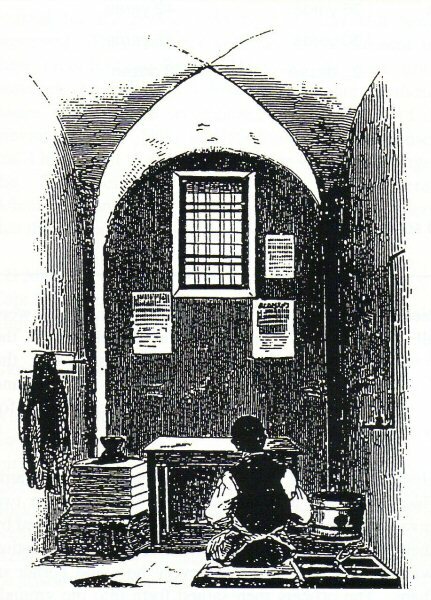 The Governor walks past the several cells saying as he goes `All right-all right' to each prisoner, who stands ready drawn up at the door, as stiff as a soldier in his sentry box, with his hand raised by way of salute, to the side of his cap, no sooner have the words been spoken when the door of the cell is closed again. Later in the day we were present when two prisoners, who had been reported for refractory conduct, were brought in for examination before the governor in his office. The report-book lay upon the table, and the governor pointed out to us that the offence of the one was refusal to wash the slates and go to chapel, and that of the other wilful disturbance of the congregation in the chapel by clapping his hands. The former of these had been liberated from the dark cell only that morning. He was, comparatively speaking, a mere boy, and entered the governor's office in a determined manner. But seeing us there he became frightened, mistaking us, we were told, for some awful government authority. So when the governor asked him what he had to say, and whether he admitted the charge, he nodded his head sullenly in assent, and was immediately marched off to the dark cell once more. The next offender was the church disturber. He was one of the Glasgow boys of whom we have before spoken, and had been sent back to Pentonville from Parkhurst. He had already been punished four times before. His face, which was almost flat and broad, was remarkable for the extreme self-will depicted in him, and he had that peculiar thick bull-neck which is so characteristic of stubbornness of temper. On being asked what he had to say, he stoutly denied the charge, declaring that it was all false, and that the officer had a spite against him. "Then," said the governor, "let the officer state his case." The warder stepped forward and declared that, during prayers that morning, the boy had clapped his hands loudly at the end of the service. The officer said he was sure it was the prisoner, because the lad stood upon a stool in the chapel, being short, and he had his eyes fixed upon him while he committed the offence. "Well," said the governor, "what have you to say now?" "I say it ain't true," muttered the boy, shaking his head, and frowning with a determined air. "Take him away to the dark cell," said the governor; and he proceeded to write in the book that his punishment was to be three days' confinement in the refractory ward upon punishment diet, with loss of stripe and removal from A Division which is occupied by convicts who are permitted to work in partial association after having passed 9 months in separation. Some of the punishments consisted of withdrawal of the premiums given for good behaviour, such as the right of receiving and sending letters, or of visits. A man feels these very keenly explained the warder. The badge of good conduct, which was a red stripe on the arm of the tunic (still in use today in the form of `red bands') was much sought after, and it was only granted to those who had conducted themselves impeccably in the first 6 months of their incarceration. Those who had obtained it were entitled to the quantity of work done, and only the best behaved among those were removed from separate confinement in the day, and allowed to work in association. Only the well conducted prisoners were allowed to receive visits from their friends. At this time there were only about 8% of prisoners working in association. 14 for having tobacco in possession. Punishments were 534 confined to the dark cell, but only 292 on punishment diet. 18 with loss stripes, and 10 with loss of one stripe. 40 were confined for only one day, 236 for two days, 249 for three days, 8 for between 5 and 20 days. I1 were confined to light cell, 26 confined to own cell (7 without secular books) 18 were withdrawn from working in association and 7 from school. Only 1 suffered corporal punishment (36 lashes). It is clear that prisoners had to conduct themselves well for 6 months to earn one stripe, only then were they entitled to a visit. If the satisfactory conduct continued they then earned a second stripe and the entitlement to a second visit. If a stripe were lost, it could be regained by a further 2 months of good conduct if recommended by the Governor and Chaplain. Visits lasted only 15 minutes and were between 2 p.m. and 4 p.m. on weekdays. The provision of letters was as follows. Prisoners were allowed to write one letter on reception and another at the end of 3 months. Also permitted to receive one letter (prepaid) every 3 months during their stay. Matters of private importance to a prisoner could be communicated at any time to the Governor or Chaplain, who would inform the prisoner. In the case of misconduct the privilege of receiving or sending a letter could be forfeited for a time. All letters of an improper or idle tendency, or containing slang or other objectionable expressions were suppressed. All letters were read by the Chaplain or Governor and had to be legible. Letters were intended for purpose of enabling the prisoner to keep up connection with their respectable friends and not about the news of the day. At 8 o'clock each morning the bell for morning prayers is sounded. The whole prison is unlocked, 2 halls attend chapel and the other 2 halls proceed to exercise. All are dressed in brown apparel with a peculiar brown cloth cap the peak of which hangs so low down to cover the face like a mask, the eyes alone of the individual appearing through the two holes cut in the front, and seeming almost like phosphoric lights shining through the sockets of a skull. The conditions for exercise are set out in detail. There were in all 5 exercising yards, the two larger yards, which were for exercising in common were called the `rope yards' and were situated on either side of the long entrance hall leading from the portcullis porch, and marked by a series of concentric rings, whilst the three others (which are for exercising apart) lie between the several corridors, and are wheel-shaped, the several radii, or spokes, consisting of walls or partitions, to separate the men walking there one from the other, and the centre serving as a small "argus", or station, for a warder, whence to survey the whole of the prisoners at one glance. These exercising yards are numbered in rotation, that on the left-hand side of the entrance hall being called No. 1, and that on the right-hand side No. 5, and the smaller private yards styled No. 2, 3 and 4, respectively. The men who were put to exercise at the hour above mentioned, turned out into yard No. 1; and as they descended a small flight of steps a warder standing there cried out, "Left!" "Right!" According to the appointed station of the convicts. The concentrated rings here consisted of a narrow line of bricken paving let into the soil, and on this lay a long rope knotted at distances of fifteen feet apart. Here the prisoners took up their station one at every knot, all with masks down, and with a warder to watch over each of the circles of men at exercise, so as to prevent all communication between them individually. There was a sharp easterly wind blowing on the morning of our visit that stung the skin and flooded the eyes, as it swept by, and made one really envy the brisk movements of the prisoners. "Now, move on, will you - come, move on!" One warder would cry to the flagging ones. "Step out there, men, step out!" Another would exclaim, as the convicts filed rapidly by them. Presently the principal warder roared, "Ha-a-a-It!" and instantaneously the whole of the brown rings that before were circling round and round, like some cavalcade at a circus, came to a sudden stop with almost military precision; and immediately afterwards the warder shouted, "Face about!" whereupon they one and all turned on their heels and commenced pacing in an opposite direction, the officers crying as before, "Step out, men," and "Move on there", as they one after another went striding past them. 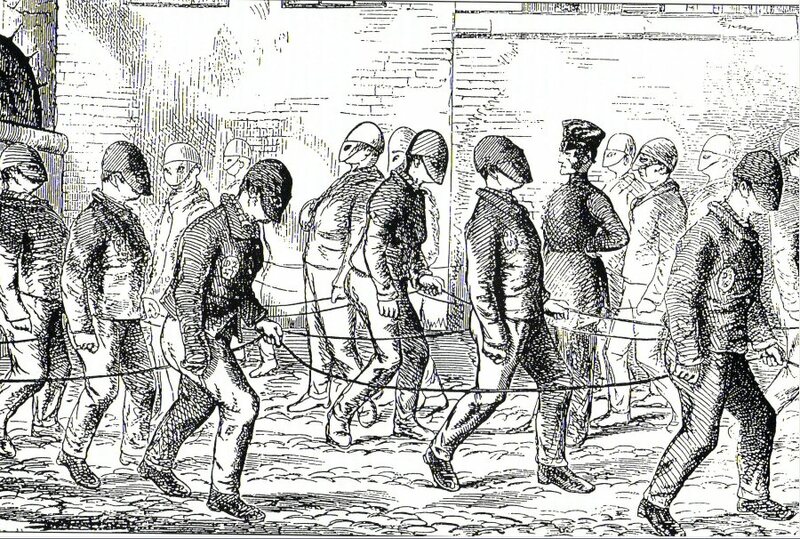 At first one is astonished at the rapid rate at which the prisoners keep moving, but a reference to the Government reports tells us that this mode of exercise has been adopted after the plan pursued at Wakefield, where we are informed the prisoners are made to walk briskly round paved paths, forming three concentric rings; and which plan has been introduced at Pentonville, because, as Colonel Jebb says, "experience has shown the necessity of the greatest precautions in the administration of the discipline of strict separation, in order to guard against its tendency to depress and otherwise affect the mental energies of the prisoners." 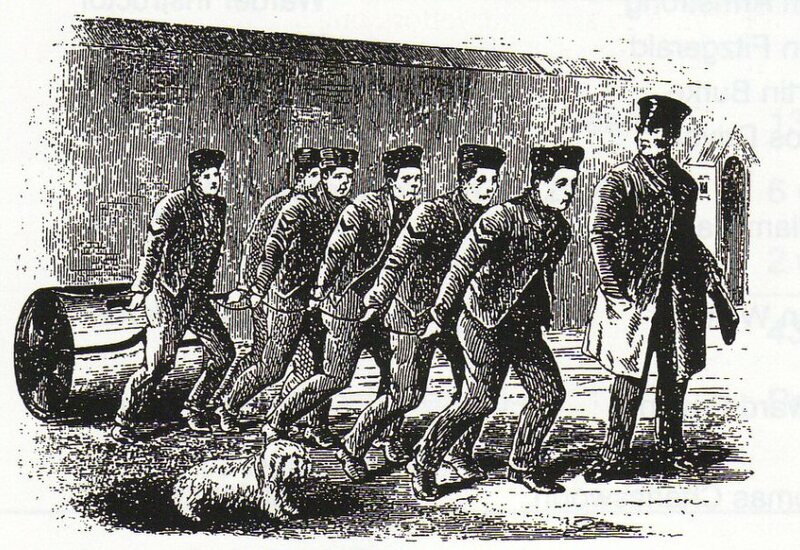 The rapid exercise, therefore, at Pentonville Prison partakes more of the character of a shaking to a drowsy man, than an airing to a wakeful one; and as medical instructions enjoin us to drag, pinch, kick, or indeed to resort to any forcible means to induce muscular exercise in a person who is suffering from an opiate, so the "brisk walking" at "the Model" is intended to rouse and stir the men out of the depression induced by separate confinement - to shake up their half-thickened blood, as one does a doctor's draught before it can be made to do its duty. Indeed, we find in the report of the medical officer of the prison, that the diseases prevalent at Pentonville are precisely those which are known to arise from undue confinement - no less than 52% of the entire disorders consisting of dyspepsia and constipation - so that out of a total of 1732 cases requiring medical treatment, no less than 1103 were affections of the organs of digestion. At 9 a.m. the prisoners return to their cells and the parade of the prison officers takes place. "Fall in!" cries the chief warder as the hour is striking, and instantly the twenty and odd officers draw themselves up in a double line across the centre corridor. They are habited in their glazed caps and short work-day jackets, that are not unlike a policeman's coat shorn of its tails, and ornamented with a small brass crown on the stand-up collar, whilst each wears a broad black leathern belt round the waist, with a shiny cartouche-box for his prison keys projecting from the hip. No sooner are the men arranged in military lines than the had warder shouts -"Stand at ease! - Eyes front! - Rear rank fall back!" and instantly the officers behind step a pace backwards, their feet moving as one man. The chief warder passes between the ranks, and when he has finished his inspection of the warders, cries again - "Rear rank, forward!" whereupon the men behind draw close up to the rank in front, and then the head officer proceeds to read over the regulations and duties for the next day; after which he shouts "Break!" and immediately the warders disperse to their several quarters - the regulations just read over being placed on the desk in the centre corridor for the inspection of the officers throughout the day. At 1 o'clock the prisoners dine (the staff having taken their meal first in the mess). At half past five the prisoners have their supper of gruel and bread, and work is given out for the next day. Just before six the officers go to each cell to turn on the gas lamp. The staff then assemble in the centre corridor to go off duty, each with his keys in hand to be delivered up to the Principal Officer. When keys are correct the main body of staff go of duty leaving 4 on for the evening. Pentonville Prison, it should here be observed, is a kind of probationary asylum, where convicts are qualified, either for transportation abroad, or for duty at the public works at home, such as Woolwich, Portsmouth, Portland, and c; indeed, it is a kind of penal purgatory, where men are submitted to the chastisement of separate confinement, so as to fit them for the after state. Originally, the Model Prison was designed as a convict academy for transports, where the inmates were not only to be taught a trade that would be a means of subsistence to them in the colonies, but where a certain moral, if not religious, impression was to be made upon them, in order to render them as good members of the new society they were about to enter upon; and, in the first years of the working of this institution, the prisoners used to be fitted out in a kind of sailors' costume, and assembled in the central corridor, in their straw hats, and with their "kits" at their side, previous to their departure for the convict ship. Since the comparative abolition of the transport system, however, the convicts leaving Pentonville are sent either to Portsmouth (as we have seen), or else to Woolwich or to Portland, according as men are wanted at one or other of those establishments. On the other hand, convicts arriving at Pentonville come from Millbank, which prison now serves as a kind of depot for the reception of convicts generally, and whither they are sent from the several detentional prisons after they have been found guilty, and sentenced for the offences with which they were charged. Here an officer, with a gold-lace band round his cap, marking him as the principal warder who had come with the convict batch, stepped forward and delivered his papers to the Pentonville authorities. "You see," said the governor to us, "the officer from Millbank brings us the caption-papers, with the sentence and order of Court, as well as the certificates of conduct in connection with each man during his imprisonment, so that we may know all the antecedents of those we receive. Then we give a receipt for the bodies on the warrant of the Secretary of State, a duplicate of which has been lodged with us some days previously." The medical officer then informed us that they were often awkwardly situated with the foreigners sent to the prison. A little while ago there had been two Chinamen there, and among the "batch" that we saw arrive, there were, besides the German physician above alluded to, no less than three Frenchmen; there was, moreover, a Spaniard already in the prison who called himself a physician, and who, being unable to speak English, communicated with the doctor in a kind of Spanish dog-Latin. When the medical officer has finished his examination of the fresh prisoners, the governor proceeds below to say a few words to the men, as to the rules and regulations of the prison. We accompanied the governor down to the reception ward for this purpose, and there found the convicts drawn up partly in a narrow passage, and partly in a small room at the side. The address was at once dignified and kindly. The governor told the men that he hoped they would conform to the distressing circumstances in which they had placed themselves, and save him the pain of punishing them for a breach of the prison rules. It was his duty, he said, to see those rules strictly carried out, and he made a point of never swerving from it. At that prison, all intercommunication among prisoners was strictly forbidden, and though some might think an infringement of this rule a trivial offence, nevertheless the authorities could not look upon it in such a light, and therefore an attempt on the part of any man to hold communion with his fellow-prisoners would be immediately punished. But if there were punishments, the men would find that there were rewards also; and these rewards were open to any prisoner to gain by good conduct, without the least favour. They would find, too, that exemplary behaviour would serve them, not only in that prison, but in the one to which they might be sent hereafter; so he trusted they would spare him the exercise of the painful duty of punishing, and allow him the more pleasant office of rewarding them there, so that he might give them each a first-class character when they left and thus render their imprisonment as light as it possibly could be made consistently with public duty. When the governor had finished his oration, the chaplain came and spoke to them also. His address was of a more touching character; for the clergyman said he was well aware what a sad trial it was for them to be parted from all their friends, and it was the most painful part of his office to be visited by the relatives of prisoners - to witness the heavy affliction that convicts brought upon their families by their disgrace and punishment. He begged of them, therefore, to conduct themselves well, and to turn their own thoughts to the one Great Being who was still ready to receive and welcome them to a share of His love; one friend left to say a kindly word for them, there was One who had suffered on earth for their sakes, and who was ever ready to plead for mercy. He hoped that they would all do this, so that when their friends came or wrote to him, to learn some tidings of them, he might be able to soothe their anguish with the assurance that they had become better men, and might still live to be a comfort and a joy to those upon whose heads they had, as yet, only brought down shame and sorrow. We watched the men intently while the tender exhortation was being delivered to them, and when the chaplain spoke of their friends and relatives, they one and all hung their heads, whilst some, we could see, bit their lip to stay the rising tear; and when the speech was finished, there was many a moistened eye, and many a cry of "Bless you, sir" as the minister took his leave. After the new-comers had been spoken to as above by the governor and chaplain, they were ordered into two small rooms in the same part of the building as that in which they had been addressed; and on our returning to the "reception-room" a few moments afterwards, we heard the buzz of many voices, and found the men chattering away as hard as school boys in play-time, for they knew it was the last talk they would be able to indulge in for the next three-quarters of a year; whilst outside the door was an officer giving notice to the men that they would not be allowed to take anything into the prison but their Bibles and Prayer-books. "Have any of you got any letters, or locks of hair, or anything else to give up?" cried the officer, as he put his head into the room; "for if they're found on you in the prison they'll be destroyed. We can't be too careful, sir," said the warder, turning to us, as he held up the man's Bible by the covers, and proceeded to shake the pendant leaves backwards and forwards, in order to satisfy himself that nothing had been inserted between the pages. "Sometimes a piece of silver has been found stowed away in a man's mouth, and some convicts have been known to bring in keys and pick-locks hidden about their bodies in the most inconceivable places." The next process was the bathing, and as we entered the bath-room we found the floor strewn with bundles of clothes, and a prisoner, with his hair wet and clinging in matted "pencils" about his face, busy dressing himself in the Pentonville flannels, shirt, and stockings, and with a couple of warders in large aprons standing by. In the adjoining bath-room was another convict splashing about in the warm-bath, and evidently enjoying the luxury of the brief immersion in the hot water. The next convict who entered belonged to the agricultural class, and he had been sentenced to four years' penal service also, for stealing a broom and a pair of leathern mittens. "What have you been:" inquired one of the clerks of the man. "A gardener," was the brief and timid reply. "Ever worked at anything else?" was the next question. "Always at that kind of work," the man answered. "Been in prison before?" "Yes, sir." "Learn anything there?" "I learnt mat-making, if you please, sir." "Can you make a mat?" "Well, I'll try, sir." Whereupon the man was dismissed. The trades carried on in Pentonville Prison, we were told, consisted of weaving, mat-making, tailoring, and shoemaking; and, in the distribution of these employments, the officers look principally to the physical and mental capabilities of the convicts. Strong, broad-shouldered men are put to weaving and to mat-making, whilst the more feeble class of prisoners are set to work as tailors. At Pentonville the authorities make four distinct classes of prisoners. (1) The dangerous men, or those that are notorious prison-breakers, and convicts of known desperate characters; (2) Second probation men, or those unruly prisoners who have been sent back from the public works to undergo another term of separate confinement; (3) Ordinary "separate men", or those who are working out their first probation of nine months; and (4) The associated men, or those who, having conducted themselves well while in separation, are allowed to work in company with other well-conducted convicts. There are, moreover, prisoners of first, second, and third class characters, according to their behaviour during their term of incarceration. The first class constitutes by far the largest proportion, and consists generally of the well-educated embezzlers and forgers, as well as the more ignorant agricultural prisoners, together with the first-offence men, and the old jailbirds. The second class characters mostly belong to the more thoughtless and careless of the convicts, who are carried away by temptation or temper; whilst the third class characters usually appertain to the self-willed and refractory boys, who are from 15 to 25 years of age. Again, as regards the mental qualifications of the convicts, they are divided into first, second, and third class men. The first class consists of prisoners who have no necessity to go to school, being able, not only to read and write well, but acquainted with arithmetic as far as the rule of proportion. The second class comprises men who can read and write, and work sums as far as the compound rules; whereas the third class men are those who are imperfectly educated, and whose arithmetical knowledge extends no farther than the simple rules. This third class again is sub-divided into three sub¬classes; the first of which includes those who can read and write, and do the simple rules in arithmetic, whilst to the second belong such as are learning the simple rules, and the third comprises all who can read, write, and cypher only imperfectly, or not at all. Of the well-educated class of prisoners the proportion is about 14% of the whole; of the moderately-educated class there is not quite 8%; whilst the imperfectly-educated prisoners average nearly 80%. The Prison Department has just returned to undertaking an assessment of prisoners' ability in literacy and numeracy on first reception. This is based on recognised education tests, and one of the current Key Performance Indicators is to measure the development of such prisoners during their period in custody. The Victorians were 150 years ahead of us and Pentonville had its own approach to testing educational qualifications, and made education a priority. The Schoolmaster in 1856 was able to provide a classification of prisoners by educational ability. which the prisoners on the fist tier are set to work; and shoemaking, in which trade the men on the upper tier are generally engaged. In addition to these, there are a few convicts employed as carpenters and blacksmiths, and to them the "shops" in the basement of C division are devoted, whilst there are still some others working as cooks, bakers, and cleaners, besides a few bricklayers employed in the grounds. "It's astonishing," rejoined our guide, "the quickness that some men display at learning their trades." The trade instructor proceeded to spread the rugs out upon the pavement, so that we might see them to better advantage. They were both of a kind of rude velvet pile work, and the one had a blue ground, with a red and white pattern tastefully worked upon it, while the ground of the other was a chocolate-brown, with red and blue figures. They had been made by the same man, and the trade-instructor, we could see, was not a little proud of his pupil. After this we were led to the shoemakers' little shop, at the corner of one of the corridors. Here, of course, there was a strong smell of leather, and the place was littered with lasts, and boots, and small stacks of soles, like cakes of gutta-percha. The officer who had charge of the shop showed us a pair of high-lows that had been made in the prison by an agricultural labourer. "He had never put stitch to leather, sir, before coming into the prison," said the official, as he twisted the boots over and over for our inspection. Then he produced a pair of convict boots with upper leathers as stiff as mill-board, and heavy soles with hob-nails upon which reminded us of a prison-door. These had been made by a farm servant who is a convict, and were worth, said the officer, "at least twelve shillings." Some men, he informed us, would do a pair of such boots in the course of a day's work at Pentonville, which was not like a day outside, he continued, on account of the many interruptions. "It's strange," repeated our attendant warder, "how some men pick up a trade. We always find farm servants learn the quickest, and that simply because they ain't above doing as they're told, like the well-educated clerks and others that we get here." The trade-instructor then produced a pair of cloth boots, with patent leather at the toes and sides; these had been made, he told us, by one who was not a very good hand when he came to the prison, but had so far improved as to turn out a pair of boots like those, which would pass muster in many a shop." "We supply all the Government prisons, sir, with the convict cloth," said the storekeeper; "and in some years we weave upwards of 50,000 yards here. But we not only weave the cloth, sir - we make up the clothes as well; and in the year 1853 the tailors here turned out more than 5,000 jackets, 4,000 vests, and nearly 7,000 trousers, besides repairing 4,500 old ones; and that isn't such a very bad allowance of work, seeing that we had only 150 tailors in the prison. Then the attendant drew our attention to some really handsome mats and rugs, the surface of which was almost like Utrecht velvet. "Some of those, sir, I call uncommon tasty things," continued the official, "and such as no regular factory might be ashamed of. Our average manufacture here is about 4,000 of those bordered mats and rugs, and about 2,000 of those 'double-thumb' there," he added, as he directed our attention to a commoner sort. "Yes, sir, a man gets to see his value when he begins to do such tings as those. Besides this, we make up all the hammocks for the men at the Hulks and at Chatham." Prisoners who have passed six months in the prison, and whose good conduct entitles them to a badge, will be credited with gratuities according to the table on the next page. Those prisoners who worked in association were all located on D1, and also worked there. It was estimated that a long sentence prisoner could have accumulated as much as £20 in `gratuities' prior to discharge. They would also be provided with a good suit of clothes for discharge according to `their status' in order that they may have a fair start in the world again. Church was compulsory, but it was also a centre of communication by the prisoners. They would drop notes for others to pick up, pass notes under stall doors, scratch messages in the woodwork, or tap messages. As only their head was visible, although the officers knew it took place, detecting it was more problematical. It was a great source of vexation to the Governor. It is also known that the Chaplains were not over enamoured by the system due to the distraction of communication between the prisoners but also the isolation one from another detracted from the proper social character of public worship. The Chaplain at Wakefield wrote extensively against the `stalled system' and was supported in his concern by a very eminent governor at Wakefield, Mr Shepherd. Despite all that, there were prisoners who changed due to the influence of the Church and the Chaplain. A letter is cited from one young prisoner who declared his `new life' in an impassioned letter prior to sailing for Australia. Apparently he was both sincere and genuine and later returned to England, both honest and highly prosperous, having amassed a considerable fortune in the colonies and still leading a godly, righteous and sober life. The last act of the day was closing up the prison for the night. Today's Orderly Officer will notice a host of similarities. Work for prisoners ceased at 7 p.m. From 7 p.m. to 9 p.m. the prisoners were allowed to read the books and periodicals they had obtained from the library. At 8 p.m. books were collected and placed outside the cell door along with the clothing and cell furniture of those who have attempted to break out of prison. The night duty roll is then placed upon the desk in the centre corridor, inscribed with the number of prisoners contained in each division (wing) together with the name of the officer attached to each for the night. At quarter to nine the last bell rings for the prisoners to erect their hammocks and prepare for bed. The cell lights are then all extinguished. The sailor like cutlasses that are worn by the warders during the night are brought out ready. Every part of the building is inspected and every outlet checked to ensure it is locked. The staff searched every area with only a bull’s-eye lantern to light the way. The chapel was pitch black, but the warder's lantern was flickered into every corner, so that the officers might satisfy themselves that no-one was hidden there. After this we hurried away, up the clock tower, to the chapel roof, and when we had thoroughly examined this, we hastened down again, the warders telling strange stories by way of ingenious escapes, as to how one Hackett had cut a passage for his body through the floor of his chapel stall during the divine service and escaped through a small hall in the wall made for purpose of ventilation, and how another had cast a key to fit his door out of a piece of water-pipe. The outside exercising yards were all checked, and then we hastened below into the basement corridor of C, where we saw that the carpenters and blacksmiths shops were all safe, and examined whether the ladders were duly chained up for the night. Hence we hurried up the stairs to the infirmary wards (located behind the Chapel) where we found the two invalids asleep, and the infirmary warder there seated by their side, and thence we descended to the reception wards below, and inspected every hole and corner of them. The officers then sallied forth into the grounds once more, leaving their lamps behind. This was done to see if there were any lights on in the cells, for the prisoners, they said, occasionally made candles out of meat fat and pieces of the thread supplied for work. Having satisfied themselves on that, they again checked all the entrances to the buildings from the outside, as they passed around the walls. Now the last office had to be performed - the four of the eight sets of keys that were retained at the six o'clock muster had now to be delivered up. They were handed over by the warders going off at 10 o'clock to the principal on special duty for the night, and by him carried to the chief warder's and placed in the iron safe and securely locked for the night. The prison was then finally reported to the governor as `all secure'.